On the 18th of Feb 2018 commencing at 8.30am we will be inviting members of the public to come and try sailing. a free community event which allows all member of the family to get out on the inlet, on Sailing boats of all size to promote the social, community and competitive sides of our sport. The first race will commence at 10am on the 25th of Feb, following a race briefing at 9am. Please ensure that you completed your safety (cat 6) check prior to the race series commencing. We would encourage all skippers to nominate for the whole 5 race series ( Nomination Fee of $225 ). Each race will have it own prize, and each race will add to the LINDSAY JOICE SERIES POINT SCORE. Sailing instruction will be posted prior to each race on the website and on our facebook page. Remember the Ellis Beach facility is CASH ONLY. BTW on the 24th and 25th of April there will be a tackers program running at the same time – lets welcome the new sailors to our club. For the final event of 2016, we hope that all vessels and crew can join the CYC Race to Fitzroy Island. The Race will commence at 11am, Race breifing will be held at 10.30am in the boatshed. Nomination fee of $40/ vessel. 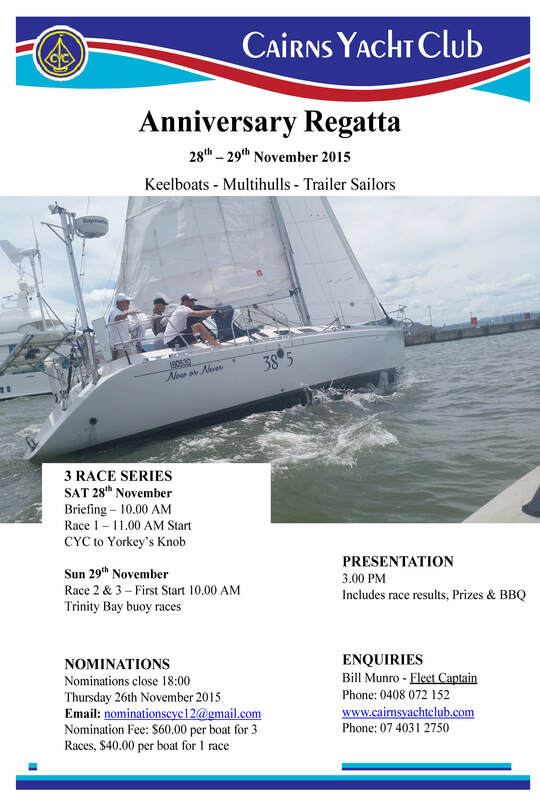 Calling all vessels and crew to join in the Anniversary Regatta on the 28and 29th of Nov 2015. A race series designed to get you out racing. Due to the expected STRONG WIND WARNING for FNQ (today – monday) i have decided to cancell our saturday sailing for the 3rd of Oct..
See you all next saturday for a great day on the water.